Is Such a Ship Needed? Moscow’s made a start in this direction, but Rogozin might be exaggerating its progress. More interesting is his intimation that the MOD is making trade-offs in the process of cobbling together GPV 2018-2025. Are large (and expensive) ships out in favor of neglected military transport aircraft? Rogozin rails against “endless” modernization but, practically in the same breath, insists the MOD won’t forget about PAK DA as it prepares to produce updated Tu-160 bombers. Perhaps someone will remind him there are things besides modernization which interfere with the development of new weapons. President Vladimir Putin met Thursday with Defense Ministry and aviation industry leaders to discuss military aircraft production. Kremlin.ru covered his introductory remarks to the assembled group at the 393rd Air Base in Krasnodar Kray. Putin touched on PAK DA, UAVs, and damping down industry expectations of funding above and beyond GPV-2020. To the OPK reps present, the president again stressed timely deliveries of high-quality equipment at reasonable prices. He took a pretty hard line with the industry, saying it agreed with the GPV last year and there won’t be more than the 19 trillion rubles promised to buy arms and equipment for the Armed Forces. It seemed odd he didn’t dwell at all on PAK FA development, or Su-34 or transport aircraft procurement. Putin began by noting that most in attendance were at last year’s meeting on the OPK’s readiness to fulfill the Gosoboronzakaz. He mentioned aviation’s “decisive role” in modern operations, and once again said that the military (in this case, the Air Forces) have to be prepared to complete missions beyond Russian Federation borders to fulfill Moscow’s alliance obligations. 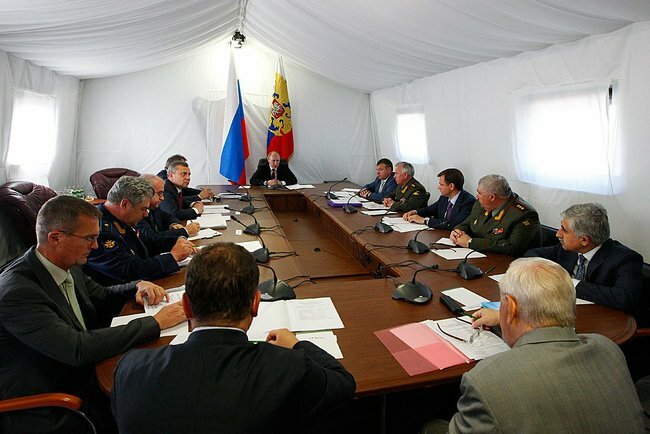 Putin said the VVS will receive 4 trillion rubles, almost a quarter of the GPV money, for their rearmament by 2020. He noted that essential modernization of Tu-160 and Tu-95MS strategic bombers has taken place, and a new ALCM is entering the inventory. Putin next discussed UAVs and their growing role in combat operations. He said Russia must develop them, and he plans to spend 400 billion rubles on pilotless aircraft by 2020. The president claimed 30 squadrons have already received new aircraft, and he repeated the familiar goal of providing the VVS 70 percent new equipment by 2020, including 600 new airplanes and 1,000 helicopters. He mentioned work on Russia’s military airfield network. During the last four years, four new airfields were built and 28 were reportedly modernized. Work to the tune of 40 billion rubles is planned for nine more over the coming four years. Putin took pains to emphasize that “everything” was agreed with the OPK last year. The government will “support” enterprises and design bureaus as they modernize factories and facilities. But, he again said, the demands will be severe. Defense orders must be fulfilled fully, on time, with high quality, and at economically justified prices. As earlier agreed with the Defense Ministry, profitability will be 15, 18, or even 20 percent. And the military is supposedly paying Gosoboronzakaz contracts 100 percent in advance, he added. He reminded participants most of them were present when Air Forces procurement plans were set, and most VVS contracts are long-term ones running out to 2015-2018. Putin mentioned that long-term VVS procurement contracts are relying on government-guaranteed credits (i.e. not necessarily money out of this year’s budget). Aircraft contracts for GOZ-2012 already amount to 2.5 billion rubles. But isn’t that a very small amount? The VVS will need to spend upwards of 450 billion a year for nine years to spend their 4 trillion, won’t they? And 45 billion rubles for UAVs alone. Ten billion will be spent on airfields annually through 2016.